This week I saw a dog show where a Blue Heeler had become fixated on his humans feet in order to herd them; rather then being cute, this fixation quickly escaluated to aggressive encounters. Clearly he had gained power and ownership over the people in his life. Watching this play out made me think over “herding” in general. Pushing another to go someplace where the herder decides has to be a huge, powerplay. Watching horses, you see this herding play out throughout the day as the group moves toward water, food, shade or grazing. The pushy horse is actually herding and gaining rank over you. Naturally, this made me think of Carolyn Resnick’s Leading from Behind Waterhole Ritual. Yesterday, I had an idea. I knew I wanted to do more Leading from Behind in Little Girl’s natural environment – the pasture. After leading her from behind all the way down two acres, I then fed her pelleted feed. In this act, I brought her to the food, in the most dominant “leader” position way. While she ate, I circled her to see if she would adjust her position and “watch me.” Which she did immediately, and so as a reward I removed the psychological pressure and stepped way back to let her finish. I like this sequence of events because one, it puts me in a clear leader position – follow my guidance and we get food. Next, it teaches her respect for people while they feed her. And of course, it provides a huge payoff – her grain portion, which at this point is only being fed by me. 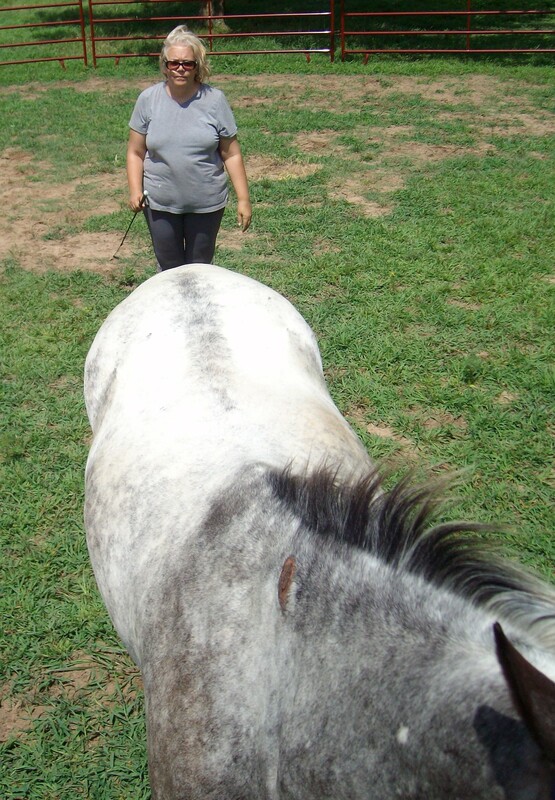 This entry was posted in Carolyn Resnick, Klaus Hempfling KFH, Liberty, Z and tagged pushy horse. Bookmark the permalink.